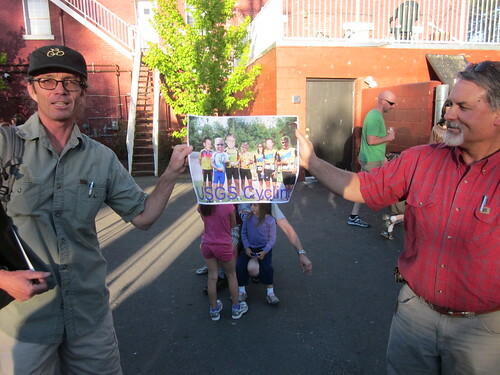 Jeff Potter told you about the Corporate Challenge results below. 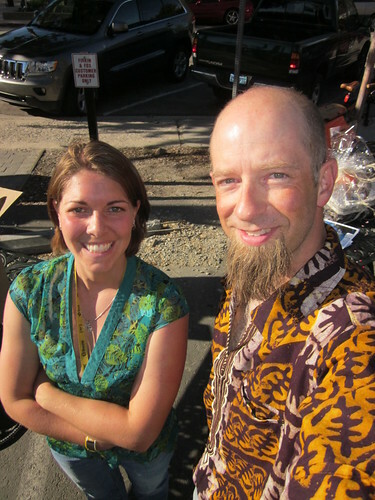 But when we weren’t fighting tooth and nail for miles and trips, we came together for a few social events and bicycle clinics! 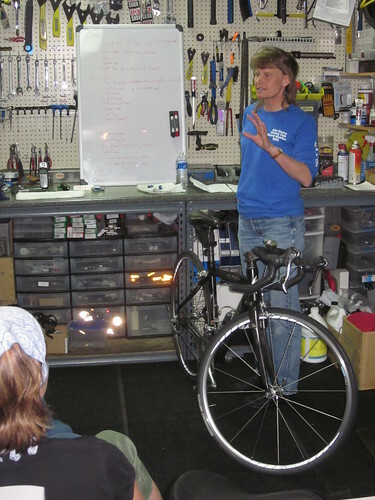 Jennie Hamiter taught a Womens Bicycle Repair Clinic down at the Bike Habitat on May 4th. The idea was to have a class for women, taught by women, with no male interference. Many times the ladies don’t get as much hands on repair experience, since the guys often jump in to take over the duties. While this is a nice gesture, the girls don’t always get the skills they need when they’re out on their own. 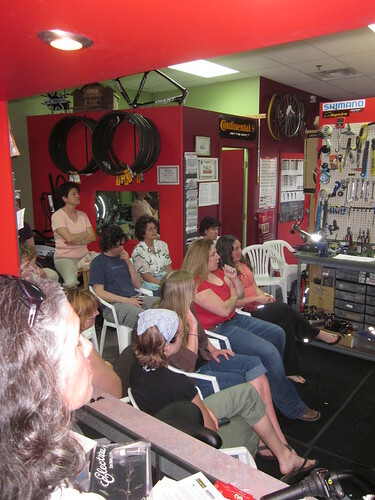 Jennie went over wheel removal, flat repair, rear derailleur adjustment, and answered questions that the audience had. 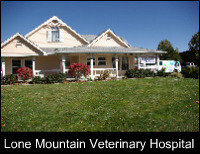 The class was successful, and a more advanced class has been asked for as a follow up! 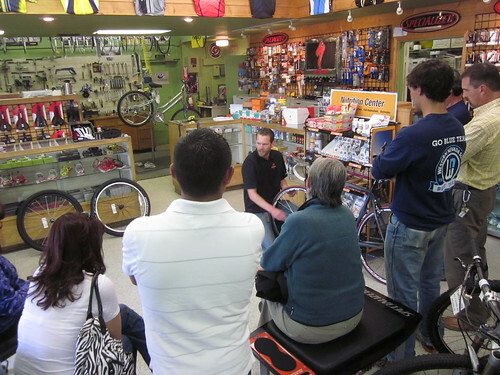 A week later, The Bike Smith hosted a Flat Tire Repair Clinic on May 11th. Mickey went over flat tire repair, and then went on to answer questions from the audience. It was good to see some new faces at this clinic, and I could see that people were excited to learn some new skills. 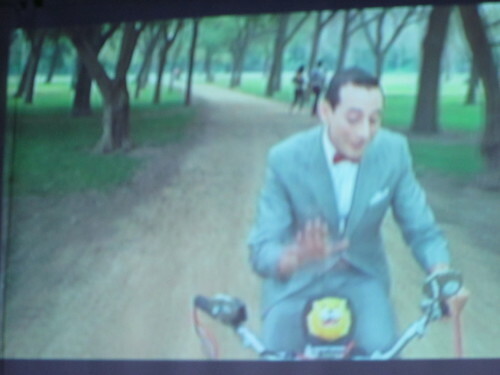 More photos of Bike Movie Night HERE. 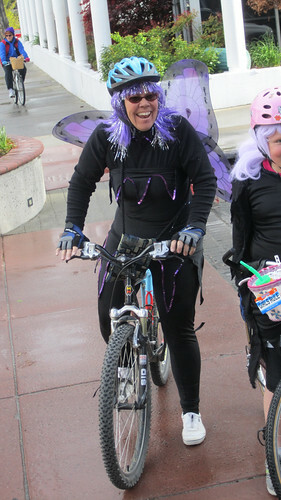 Monday May 16th was the first day of Bike to Work Week. 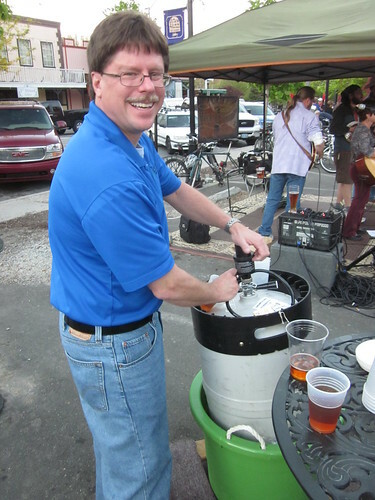 We celebrated the first day with a fun social down at the Tap Shack on Rice Street. 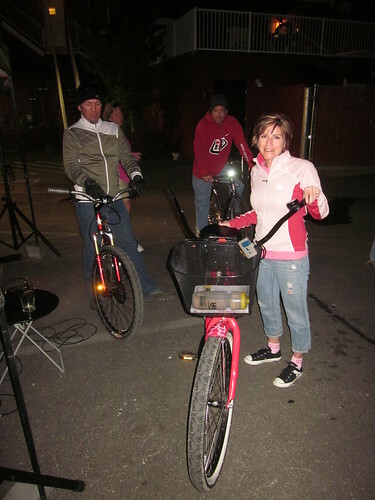 James Wilsey came down from Reno to play guitar and sing for us, and we filled up the back patio with bikes. 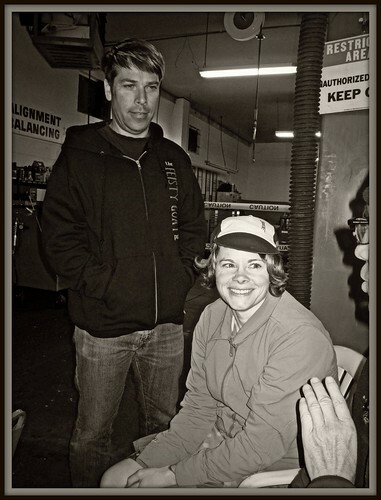 It was a chilly beginning to the week, so it was nice to be huddled into the cozy Tap Shack to stay warm. The tunes went on until about 10:00 PM, and we even had people help James out on the singing. 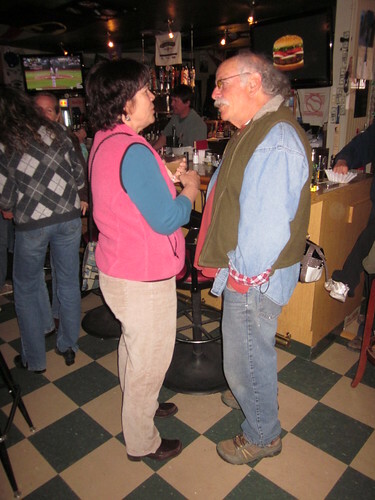 More photos from Social Night HERE. 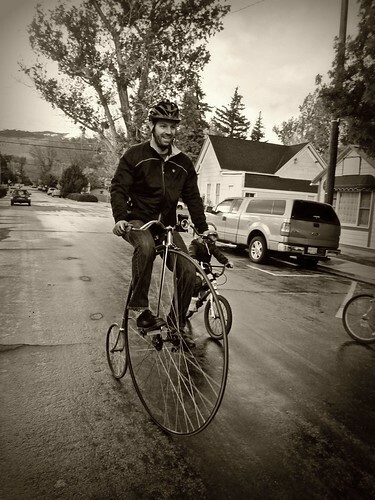 Nathan Harrison takes the Hi-Wheeler for a spin…Look Out! 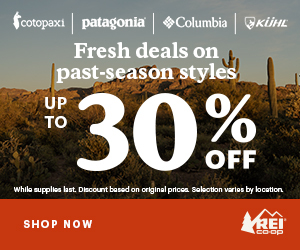 Kelly Clark – Costume or real life? 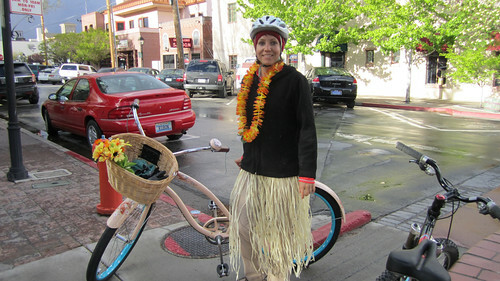 More Photos of the Cruiser Ride HERE. Bike to Work day arrived on May 20th, and we finally had nice weather! The day began with Free Coffee at Comma Coffee and participating area Starbucks. I rode down to Comma Coffee and hung out for about a half hour. 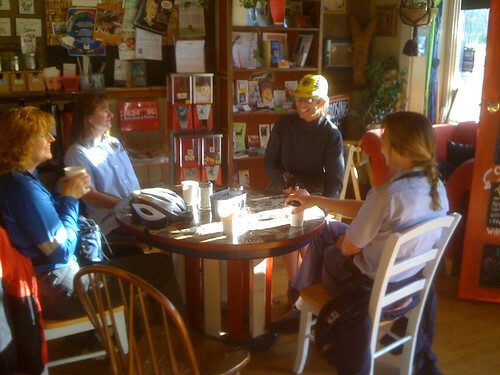 This was definitely our biggest turnout for coffee in the four years I’ve been helping to plan Bike Month. Various commuter teams came in for their morning java, but there was no trash talking…only the sharing of the excitement of the day and the stories of the fun we had all week. Free morning coffee at Comma Coffee! 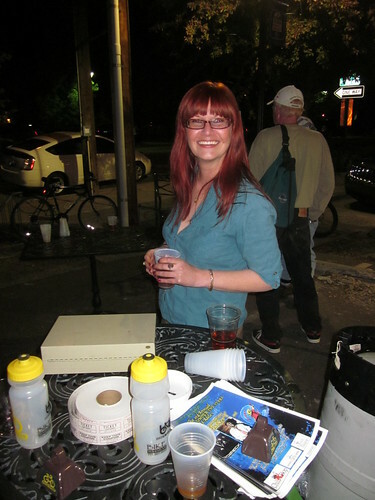 After work, riders pedaled down to the Firkin and Fox for our end of the week celebration. 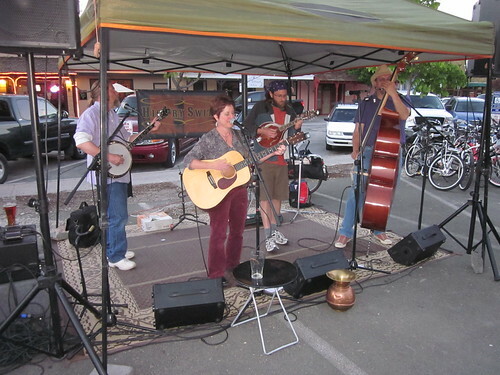 The High Sierra Brewery donated a couple kegs, and Hick’ry Switch was there to entertain the crowd with their lively bluegrass music. 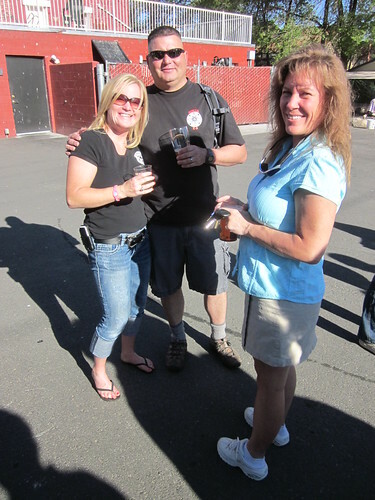 Proceeds from the raffle tickets and beer sales went to benefit Muscle Powered, and both were selling fast. 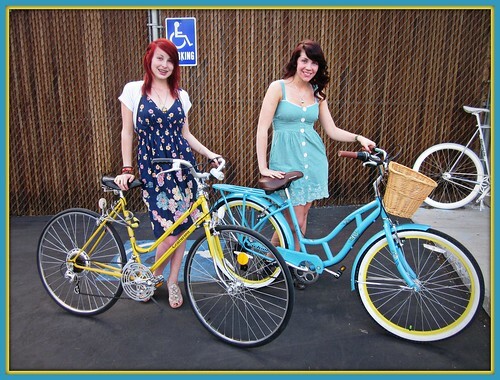 The grand prizes were two cruiser bikes from Phat Cycles that Dan Turner at the Bicycle Authority helped us acquire. 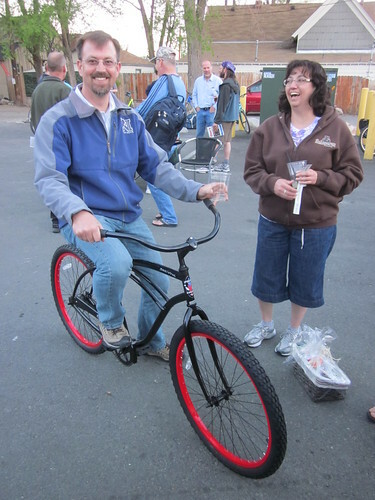 In year’s past, the bikes have been highly contested items, but this year, the raffle went smoothly, and the bikes seemed to find their new owners just fine. Many other great prizes from local businesses were given out as well, and many people went home a winner. 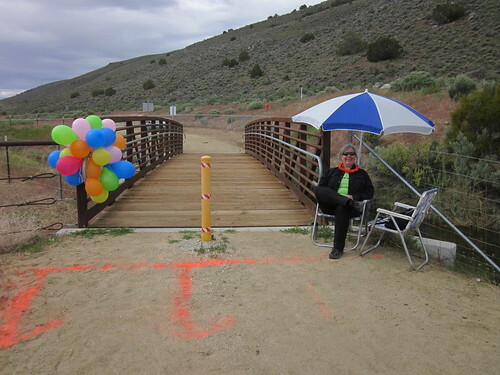 Winners of the Corporate Challenge were announced, and once again, NDOT really cleaned house. I was happy to be on the 2nd place team for the number of trips though! 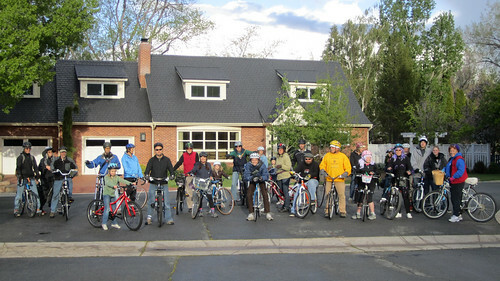 In the end we all had a total of 1,222 trips made by bike or on foot, and 3,792 miles traveled without a motor vehicle! 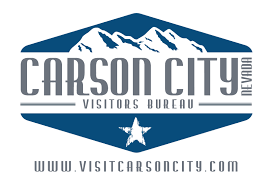 These are big numbers when you think of the impact on our city’s roadways. 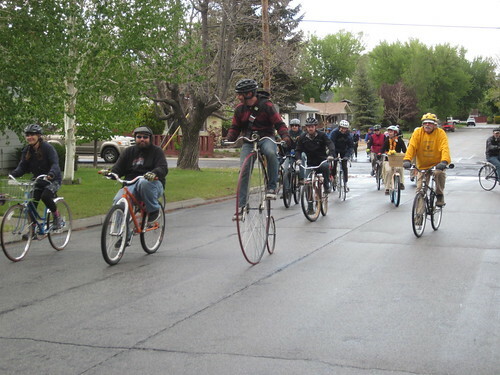 Bike to Work Day needs to be way more often. 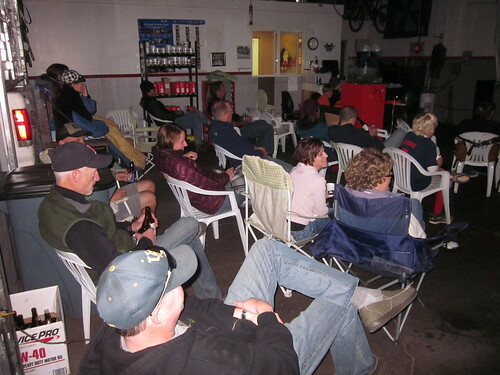 The party went until after dark, with many folks even staying well past the raffle. 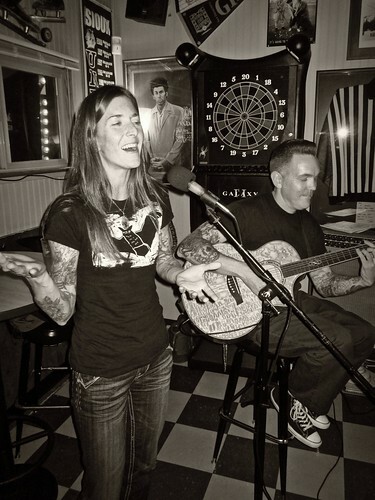 It was a party so fun, that it made the front page of the local paper the next day! 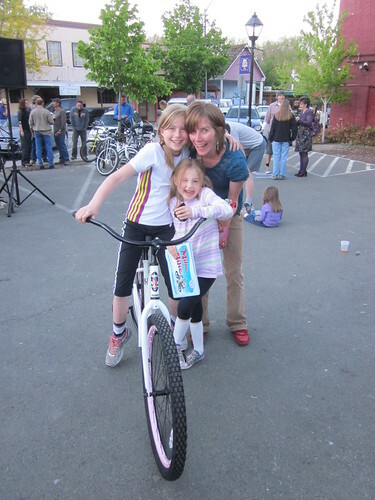 Heidi Ayarbe and nieces win the Womens Cruiser! 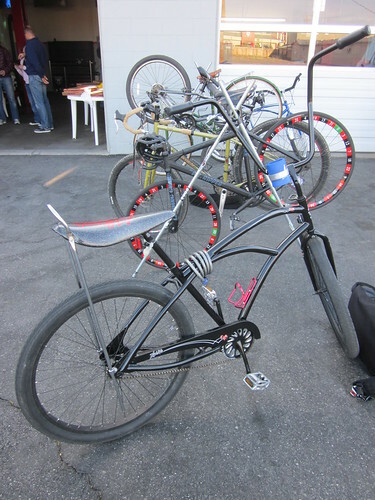 Tom Young, Winner of the Mens Cruiser! Saturday morning came way too fast, but I made it down to Riverview Park for the Run/Walk/Bike Put Your Best Foot Forward event. 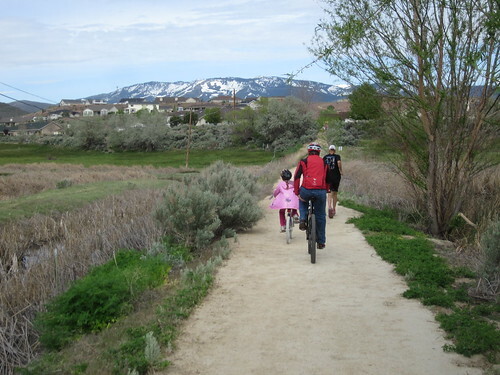 All ages of participants showed up to enjoy the beautiful wetland scenery. Local groups CASA, We Can, and Muscle Powered all volunteered for the event, and we all shared the donations that the participants threw into the bucket. There were plenty of snacks as well, and all the kids went home with a prize. Good times! More photos of Put Your Best Foot Forward HERE. Thank you to everyone who planned, volunteered, and donated goods and services! 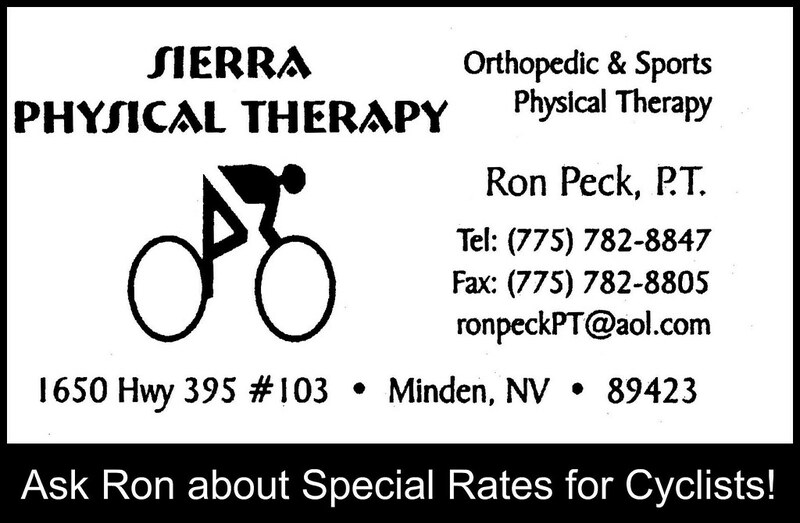 Thank you to the Nevada Appeal for doing a great job covering Bike Month. But most of all, thank you to everyone who showed up and participated in our events and made them worth planning in the first place! 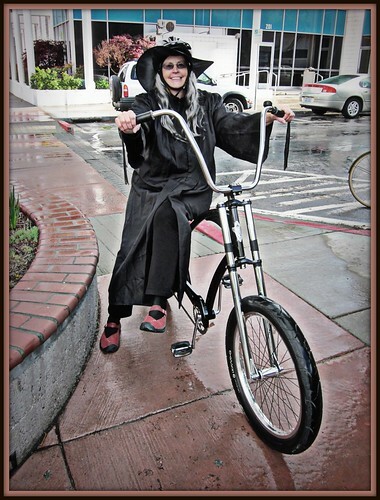 It’s our hope that everyone had a lot of fun, but also that we inspired more people to consider their bikes as a legitimate form of transportation. Don’t put those bikes away. Let’s keep the momentum going! 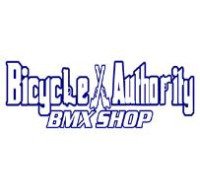 Hope to see everyone at Thursday’s Bike Polo Tournament at the Bicycle Authority!